Jemez Pueblo is the northernmost of three major Pueblos along the Jemez River, a tributary of the Rio Grande. 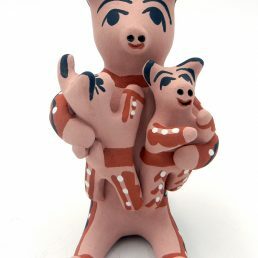 Jemez Pueblo pottery has gone through a unique evolution, one that has resulted in modern handmade pottery that speaks of a marriage of cultures. 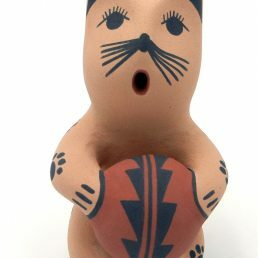 Traditional Jemez Pueblo law forbids the writing of their “Towa” language, but oral history accounts indicate that the pottery styles and designs characteristic of Jemez Pueblo artists today are quite different than their ancestors’. Traditional Jemez Pueblo “Black-on-White” and other styles died out in the 1700s when hundreds of vessels were destroyed to keep them from the Spanish conquistadors. 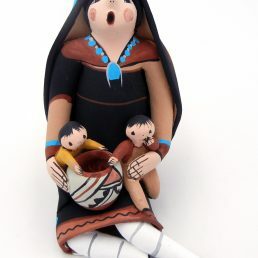 The Jemez Pueblo pottery style of today is heavily influenced by the Zia Pueblo, neighbors who helped revive Jemez Pueblo’s pottery tradition. 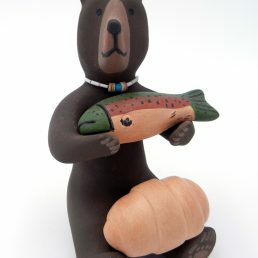 Some handmade pottery by modern Jemez artists has a glossy appearance to it from their traditional stone polishing technique. Most designs are geometric patterns that are either painted or etched into the piece. Jemez Pueblo pottery is often uses a red slip on tan, but artists have begun using a broader color palette that includes light blues and greens. Jemez Pueblo pottery often incorporates the kiva design, commonly at the mouth of the vessel. The three (or four)-step cut-out represents the stages of life: birth, life and death (afterlife). 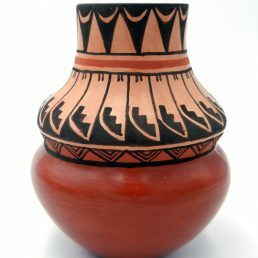 Wedding vases and seed pots are pieces common to many Pueblo nations, but the Friendship Pot is unique to the Jemez Pueblo pottery tradition. Often decorated with turtles, a sign of water and life, these pots have clay people molded to the top as if looking in—a reminder of the friendships that flourished during gatherings around water-collecting pots after a rain storm. In light of the drastic change in Jemez Pueblo’s pottery style and tradition, it is fitting that two of the most notable pottery artists are known for deviating from traditional vessels. 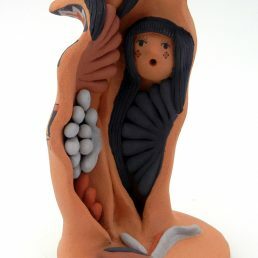 Kathleen Wall and Fannie Loretto are both Jemez Pueblo artists who have won recognition for their contemporary pieces. 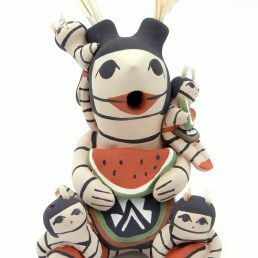 Wall creates koshari clowns modeled after her children, and Loretto designs koshari masks. 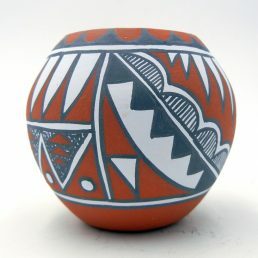 Palms Trading Company carries a fine selection of both traditional and contemporary Jemez Pueblo pottery. 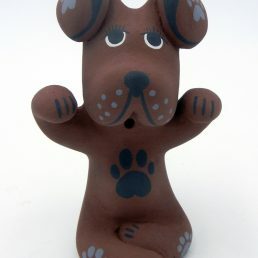 We buy pieces directly from the artists, so we guarantee they are authentic, Native American pottery. Our online selection is a small sample of what we carry in our store. 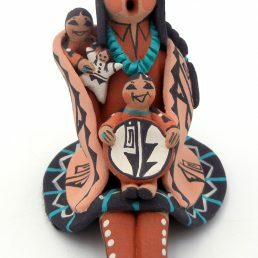 If you’d like to see more Jemez Pueblo pottery, contact us to use our personal shopper service.